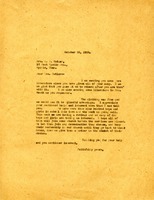 John R. Adams writes to Martha Berry apologizing that his income is limited and he can not send a check for her work. He mentions that he is sending a carton of clothing to be used for the mountain people. She hopes that perhaps he will be able to adjust after losing his wife of 53 years of marriage. Mrs. Walter informs Martha Berry that she is sending two black coats for girls and one pair of boys black pants. 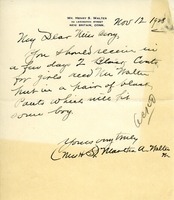 Martha Berry assures Mrs. Croomes that the school received her gift of clothing and that her acknowledgement letter must have been lost in the mail. She also informs Mrs. Croomes that they are happy to accept monetary donations at any time of the year, but they do not give gifts of money to the students. In addition, Miss Berry tells her that a one hundred and fifty dollar donation will keep a student in school for a year. 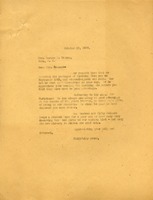 Letter from Martha Berry to Mrs. A. K. Cutler sending literature and in appreciation of her continued support. Elsie A. 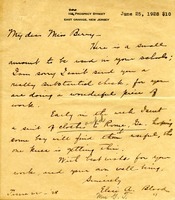 Blood sends a check for $10 and informs Martha Berry that she sent clothes for the boys in Rome, Georgia a week prior. 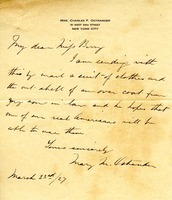 Mary M. Ostrander writes Martha Berry about her donation of several clothing items. Julie V. Loew writes Martha Berry inquiring about clothing donations, informs Martha Berry of her mother's passing, and provides her new address. 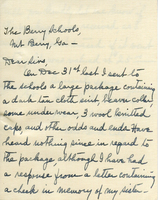 Mr. Lyall writes to Martha about some old clothes that he sent the other day to the Berry Schools. 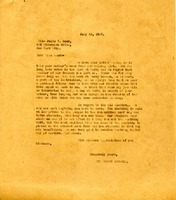 S. C. Wrtzel has sent Martha Berry a box of worn, but good clothing, by freight by request of Miss Berry, and is asking if this sort of this is good if she should send more occasionally.